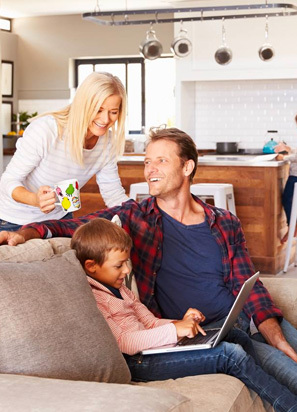 The best way to protect your home and family’s health while in the house is to start with a whole home air cleaner. There are many different types of air cleaners and your comfort consultant will be able to explain the differences for you. Many of these air cleaning units are quite affordable, easy to install and maintain, and as intended, cleanse the air prior to breathing it into your lungs. Air cleaners remove a wide variety of dust, pollen, allergens, and pollutants from the air by passing it through a high efficiency particulate air (HEPA) filter. This is a mechanical filter which pulls airborne matter and presses it into a filter so it cannot be released and breathed in by humans or animals. These devices also protect and extend the life of your furnace. Keeping the blower motor clean and free from dust helps to reduce breakdowns of your furnace. To find out how you would benefit from adding a media air cleaner into your homes heating and cooling system just give Blue Frost a call.